BAY HEAD, N.J. — The members of the 2015 National Sailing Hall of Fame (NSHOF) were honored during ceremonies that were the highlight of a weekend of activities at Bay Head Yacht Club. 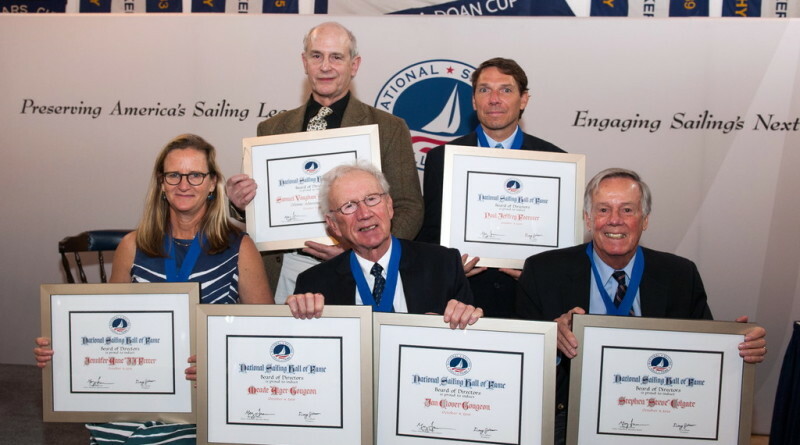 The 2015 Class of Inductees, six of the sport of sailing’s significant contributors, are as follows, sailing school founder Steve Colgate (Ft. Myers, Fla.), Olympic medalist Paul Foerster (Rockwall, Texas), Olympic medalist and author JJ Fetter (San Diego), boat building innovators and brothers Meade and Jan Gougeon (both Bay City, Mich.) and U.S. Olympic Yachting Committee Director Samuel V. Merrick (Medford, N.J.), the recipient of the NSHOF’s 2015 Lifetime Achievement Award. In their remarks the inductees were remarkably consistent: each had taken any and every opportunity to learn from others and each knew they could not have achieved their success without significant support from others. The six members of the 2015 Class of Inductees, along with the 42 heroes of the sport who have previously been inducted, exhibit the values and sportsmanship which sailing promotes. It is the primary mission of the National Sailing Hall of Fame to preserve and share the legacy of passionate contributors to the sport. Find out more at nshof.org.